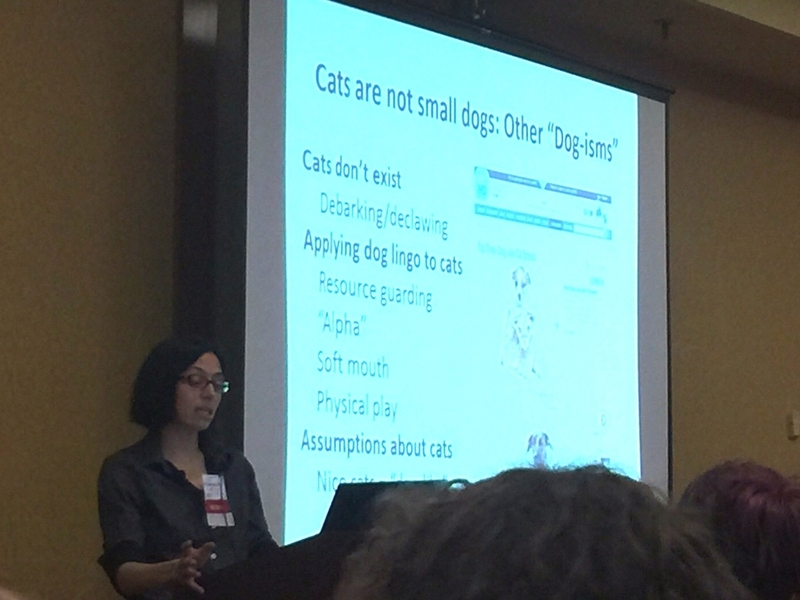 The International Association of Animal Behavior Consultants (I-double A-BC) hosted their first Feline Behavior Conference in Atlanta, GA on April 11-12, 2015. It was a HUGE success. I am extremely glad I flew up there for an amazing and educational weekend! I could literally write a book on this weekend, so I am going to keep it short to a few points for each presentation that I found most interesting and useful. Like the snazzy bag from the IAABC? I do! 74% of dog caretakers are women. 78% of cat caretakers are women. 3.4 million of 7.6 million animals that enter shelters are cats. Cats are family-based social animals. They must learn their social behavior as a kitten from socially competent members of the species. Adopt families together. Feral cats voluntarily form colonies. Feral cat social organization is matriarchal. Queens cooperatively rear kittens. Human-directed aggression can be instigated through play, fear, petting intolerance, redirected or sexual aggression. Be a “boring” human in order to discourage play aggression. Cats primarily groom each other on the head and neck. Skin problems can cause stress and be a result of stress. There is an intimate relationship between skin conditions & stress in humans and felines. There are several OCD disorders that can affect cats. 50% of cats presented for house soiling began after 10 years of age. It is common. Medical factors, cognitive decline and sensory deficits play an enormous role. Studies show that cats do have preference in litter boxes, but not always for the uncovered (compared to covered) box. Each cat has their own preference that they stick to. Also, studies show that a bigger box doesn’t matter (as long as it is large enough for the cat to turn around in comfortably) as much as a clean box does. If the cat is showing abnormal behavior, drugs may be a suitable option. No FDA approved psychoactive medication is approved for cats. There are only three approved for use in dogs. Shelters need to have a room for cats to live that resembles a home, so they may have suitable places to hide and adjust easier to potential adopters. It can take up to a year, for a previously traumatized cat to come out of his or her shell and turn into a lovebug (Beth did it!) using positive reinforcement. Figure out what the cat wants, and give it to him or her, when they ever so slightly do what you’d like them to do. Even if that means “human go away” as the reward. 70% of companion cats that enter animal shelters are euthanized. Setting up cats for a successful adoption includes handling, socialization, teaching behavioral skills and fostering. Declaws are for the human’s benefit only. It is a partial-toe amputation. Humans rarely consider the cost of post-surgery complications, such as aggressive biting and/or improper elimination because the litter box hurts their sensitive declawed paws. Declawed cats need a safe space that they can hide in, where the landing is soft and high. Name Game, Recall, Nose Target and Go To Place are fun and rewarding! There are relatively few cat behaviorists, putting canine behaviorist in a position to diagnose interspecies problems since cat-dog households are very common in the United States. Declawed cats need ramps or steps to access safe space from dog. They need to be safe. Research indicates that cats and dogs can learn each other’s communicative signals. Do not elicit aggression to just “test the waters”. Less is always more with cats. Scruffing is stressful. A cat is scruffed when it is a kitten, or as an adult when it is being killed by a predator. A belly rub is a violation of trust. A cat showing its belly is a greeting only. There are roughly 30 calories in a mouse. Geriatric diet generally not needed. Cat food labeled “real chicken” is mechanically deboned chicken, aka “slime”. Cats are not neophobic about new foods. “Finicky eater” is a product of environment, not the food. Feeding is an opportunity for an enrichment activity. Similar to Functional Bladder Disorder in humans. UTI specialized food does work. No evidence that there are drugs to help LUTS. Humans who have cat companion animals tend to be neurotic. More research to come on this! The panel discussion on Saturday evening had Dr. Sharon Crowell-Davis, Dr. Leticia Dantas, Jacqueline Munera, Mikel Delgado, and Ingrid Johnson. One of the two main topics of discussion was how to add a new cat to a household with an existing cat. Ingrid pointed out that the new cat should be personality-matched for the existing cat, then there needs to be a slow introduction including the most important detail of swapping scents. Mikel chimed in with advice that clients should enlist help of a professional behaviorist to properly set up home for success and help select the new family member. Jacqueline reminded us to incorporate operant learning, her preference being clicker training, into the new cat’s life at home. Dr. Crowell-Davis stressed the importance of olfaction to a cat, thus the introduction needs to be positive, mutually agreed upon and scent centered. She added, “Don’t molest the cat with scent.” She noted she had seen this before. Good to know! I didn’t even realize that people did that! The second topic was how to treat the relationship between the client, the feline patient, the primary care veterinarian and the behavior consultant? Confidentiality rules are governed by state, and only veterinarians are legally bound by them. Some states require written permission to share records, some require only verbal and some require no permission by the client. All panelists agreed that with the cat’s best interest in mind, all parties involved should share information to provide the best treatment and create a happy home. End of Day 2.... Peace Out!